Notes: Portchester Castle is a medieval castle built within a former Roman fort at Portchester to the east of Fareham in the English county of Hampshire. It is located at the northern end of Portsmouth Harbour. Probably founded in the late 11th century, Portchester was a baronial castle taken under royal control in 1154. The monarchy controlled the castle for several centuries and it was a favoured hunting lodge of King John. It was besieged and captured by the French in 1216 before permanently returning to English control shortly thereafter. Occupying a commanding position at the head of Portsmouth Harbour, in the medieval period Portchester was an important port. The castle saw the disembarkation for several campaigns to France led by England's kings. In anticipation of a French invasion during the first quarter of the 14th century, Edward II spent 1,100 repairing and reinforcing Portchester Castle. A plot to overthrow Henry V was discovered and the culprits apprehended at Portchester; this event features in Shakespeare's play, Henry V. Later in its history, the castle was used as a prison. 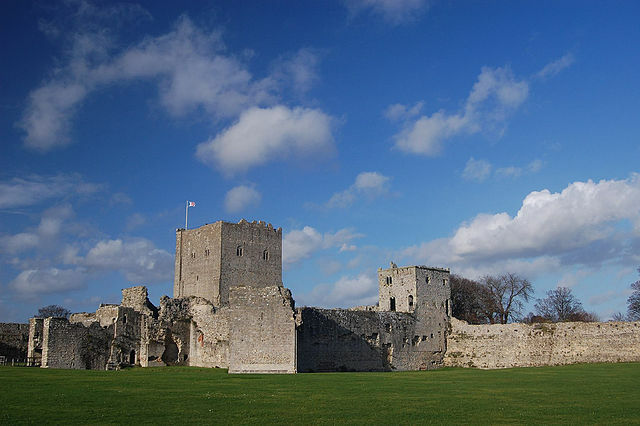 Today Portchester Castle is a Scheduled Ancient Monument, and a Grade I listed building. The castle has been in the ownership of the Southwick Estate since the 17th century but is managed by English Heritage and open to visitors throughout the year. The Norman church, St. Mary's, which stands in the south-east corner of the grounds, falls within the Anglican Diocese of Portsmouth. Today Portchester Castle is used mainly for recreation: the inner section of the castle accommodates displays and exhibits. The castle is a popular venue for school outings, while the sea front is frequented at high tide by anglers in pursuit of flounder and bass. The Collection of material relating to the French prisoners' theatricals at Portchester Castle, 1810s is held by the Victoria and Albert Museum Theatre and Performance Department.